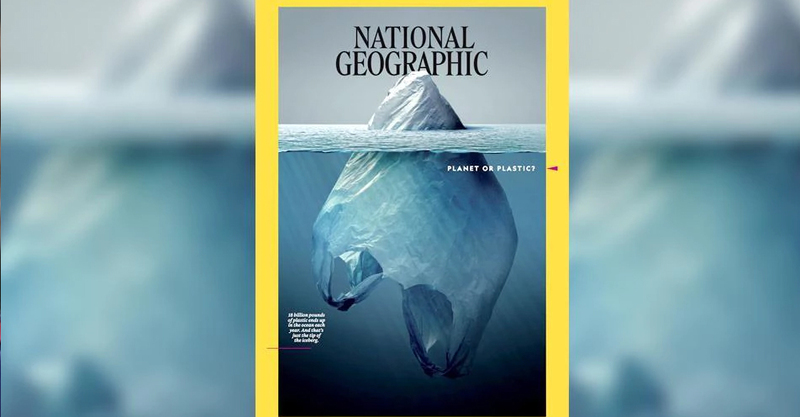 The latest cover of the National Geographic magazine featuring a plastic bag partially submerged in water has gone viral on social media and many have described it as “brilliant” and “dire”. The bag resembles an iceberg suggesting that the world’s plastic pollution is “just the tip of the iceberg”. The cover is a part of Nat Geo’s Planet or Plastic? initiative to create awareness about the “amount of single-use plastic that enters in the world’s oceans”. The magazine’s senior photo editor Vaughn Wallace tweeted the cover on May 16, calling it “one for the ages”.He also shared on the Twitter thread that starting from the June issue, Nat Geo will replace their plastic wrapper with paper. Wallace’s tweet has collected more than 26,000 likes and 13,000 retweets after being shared. “What a great way to convey the message!,” wrote one Twitter user. A leading Indian marine scientist has said that the major oceans on earth will have more plastic than fish by 2050. Dr V Kripa, the principal scientist of the Central Marine Fisheries Research Institute (CMFRI), said every year there is a sharp increase in the quantum of plastic waste getting into the ocean and if the situation continued like this plastic debris will outnumber marine creatures, especially fish.She said that 850 million metric tonne of plastic will be found in the ocean by 2050, whereas only 821 million metric tonne of fish will remain in the sea by that time. This is not the first time National Geographic has created a buzz with their magazine cover. The most iconic of them was that of the “Afghan Girl” the cover of its June 1985 issue. Sharbat Gula, the 10-year-old green-eyed girl became the symbol of the plight of refugees in the Afghanistan war.